Russian Military Analysts are reporting in the Kremlin today that the United States has, for the first time in its history, granted rights to a Foreign Army to have ‘full power’ over the life and death of American Citizens in their own country. their own country. “U.S. 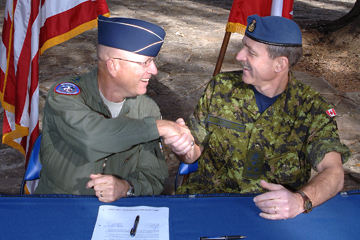 Air Force Gen. Gene Renuart, commander of North American Aerospace Defense Command and U.S. Northern Command, and Canadian Air Force Lt.-Gen. Marc Dumais, commander of Canada Command, have signed a Civil Assistance Plan that allows the military from one nation to support the armed forces of the other nation during a civil emergency. “U.S. 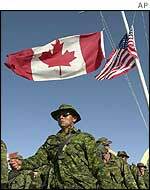 troops are being trained to conduct round-ups, confiscate guns and shoot American citizens, including their own friends and family members, as part of a long-standing program to prepare for the declaration of martial law, according to a soldier who recently returned from Iraq.